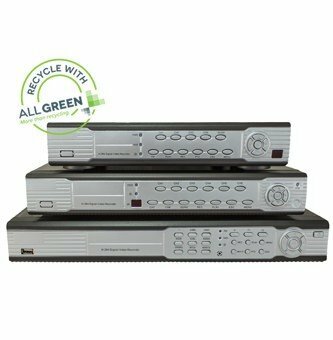 Recycling DVRs at All Green Electronics Recycling is the most efficient way to ensure the materials in your old digital video recorder are correctly and professionally recycled. A DVR, or a digital video recorder, is an electronic device that records video in a digital format and stores it to a memory card, flash drive, or other storage device. DVR use has rapidly accelerated over the past few years. In 2006, an estimated 1.2 percent of U.S. households had one, but by February 2011, the number had grown to 42.2 percent. 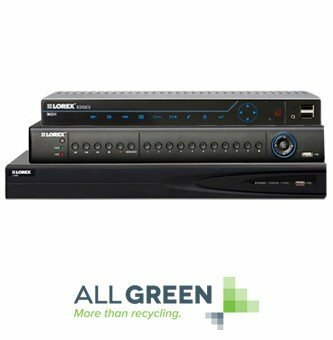 Help keep your old DVR out of a landfill by recycling it safely and responsibly with All Green! Better for the world around you and your bottom line, we provide a personalized solution for your recycling needs. Utilizing our extensive knowledge in this area, we can decide the best options for ridding you of your old equipment. Whether it be reusing components from old machines or finding new ways to use them, rest assured our methods will save you money while ensuring environmental preservation. Don’t let the burden of transporting your equipment keep you from recycling it; we’ll take care of that for you! Our hundreds of trucks available for pickup services keep costs low, flexibility in scheduling means we work on your time, friendly staff to pack, label, and pick up your equipment saves you time, and shipment tracking keeps you informed of where and when your equipment is recycled. We take the stress out of the process! From obtaining certifications such as R2 Responsible Recycling, to ISO 14001, we take your data privacy seriously. We work with a multitude of businesses daily that trust us with their sensitive information based on our history of excellence in protection. We oversee each piece of equipment that comes to us and will make any and all data available to you upon your request. Failure to properly discard your equipment can take its toll financially by way of fines and fees. We adhere to and surpass regulations set forth by the government while safely and cost effectively recycling your goods. Everything that comes to us is recycled, freeing you from worrying about your equipment after it leaves your location. We are not only offering you a complete recycling service but also piece of mind that your equipment is being taken care of in a professional manner with due diligence to your data privacy, your bottom line, and the flourishing environment. Electronic devices have taken over our daily lives and as we become more and more tech-savvy we also run the risk of destroying our environment when it comes to disposing of those devices. It is far from ideal to put DVRs, batteries, cell phones, laptops or computers into the trash. Why? Because they contain many harmful chemicals such as arsenic, lead, and chromium, all of which are harmful to humans and wildlife. So the last thing we should possibly do is to improperly dispose of such harmful items. We all know that with new emerging innovative electronics old ones become obsolete; but where do the old devices end up? Landfills? In the water supply? Affecting vegetation? Did you know that 2% of all solid waste is disposed-of electronic devices, and it is sent to landfills? Did you know that only 18% of electronics are being recycled and about 82% will end up in landfills? These devices sit and leak corrosive chemicals into the atmosphere, creating a ticking time bomb for our eroding ecosystem. Creating a hub of carcinogens in the earth’s atmosphere is not the way to go. So how should electronic devices be discarded of? At All Green Electronics Recycling we provide services such as cell phone, computer, laptop and DVRs recycling. Stepping up and taking the initiative to pack up that old DVR and turn it into reusable resources could save human lives and our environment. When you are finally ready to take those old computers, laptops, smartphones and DVRs to be recycled remember what you are doing is ultimately profitable, not only for the economy but our environment. Recycling prevents pollution and environmental damage caused by mining for metals used to build DVRs and other household electronics. Selling recyclable materials from DVRs, cell phones and televisions offsets the extra cost of collecting and processing recyclables, making recycling the cheaper option. Recycling items like DVRs also saves the earth’s resources, supports public health, and creates jobs. Recycling is noble and safeguarding the future of the next generation. If we all do our part, just think how our economy, environment and health would exponentially improve. So when you are done recording on that old DVR and have nothing else to do with it, remember our DVR recycling facilities are available for you to drop off your DVR and walk away knowing that you made a significant difference to the world.